In elementary school I went to the Old Stone School at Midway Village for a field trip, so when I heard they were having the free CommUNITY Pick-nic event last weekend, I was excited to go and walk the grounds again. After watching the talented Italian dancers and browsing around some of the vendors set up for the picnic, I walked past the Blacksmith Shop and noticed there were two men actually working in the shop! It was really hot that day, so I was very impressed that they were happily doing demonstrations and answering questions despite the heat. 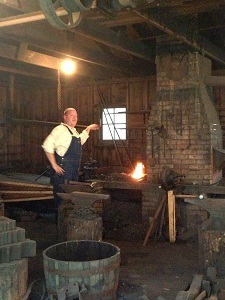 After the Blacksmith Shop, the next stop was the J.L. Clark Hardware Store, and I surprisingly spotted a few familiar items! My grandpa worked at Clarcor (formerly J.L. Clark), so there were a few tins and other trinkets on the shelves I remember seeing at my grandparents&apos; house. 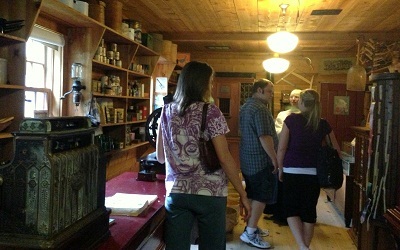 The General Store also has a multitude of old-fashioned items on display. The coolest piece I saw was actually a simple ceramic bird called a "pie bird." You basically put the small device in the center of a pie you&apos;re baking and it vents the steam and whistles like a tea kettle when the pie is done. I need to get one of those! One of my favorite parts was going into the Print Shop and watching the staff actually use the machines to print custom bookmarks for anyone who wanted one. They would take each individual letter in a person&apos;s name, spread ink on it, and roll it through the machine so the name is printed right on the paper. They were happy when I came up...because my name is only three letters! There are 27 buildings that make up Midway Village, so there is so much more you can see when you go! It&apos;s the perfect place to spend an afternoon exploring the grounds and learning about how people lived in the past. Make plans to go there soon! 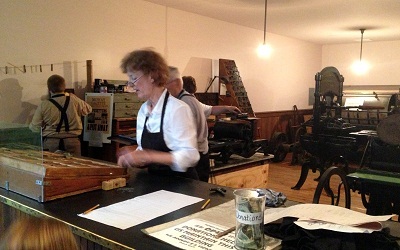 Midway Village Museum is located at 6799 Guilford Road in Rockford. For more information about the museum, visit their website.